Looking for a FUN activity for your group? We have designed hundreds of custom paddling experiences for schools, wedding parties, camps, corporate groups, big families, bachelor/bachelorette parties and all sorts of large groups. We can shape your group's experience to emphasize outdoor education, team-building, natural history, paddling instruction or just having fun on the water. Most custom trips include a mix of all those elements. 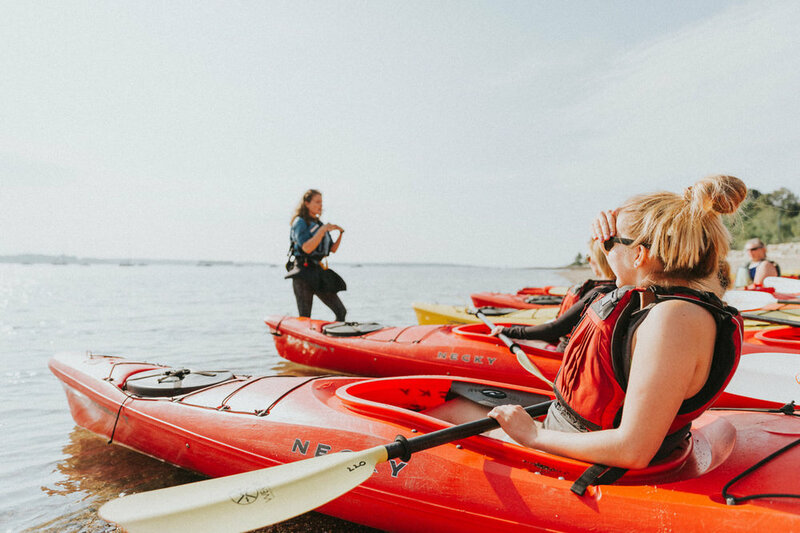 A sea kayak tour along the scenic Portland waterfront is a perfect option for many groups Two hours is enough time for your group to receive some basic instruction in sea kayaking and venture onto the waters of Casco Bay and enjoy views of lighthouses, seabirds & seals and historic landmarks. Your guide will pick a route for your trip that fits with your group's goals and interests. Our aim is to facilitate an experience that will leave everyone in your party with happy memories of paddling on the Maine coast. Stand-Up Paddleboarding (SUP) is a sport that's incredibly fun and fairly easy to learn, but it's still new to many people. Giving your group the chance to try it out in the beautiful coastline near Portland could be the perfect experience for them to share together. Our expert staff will start you off with a brief lesson and then take you on a brief paddle, pointing out wildlife and historic sights along the way. If your group is up for a slightly longer adventure, consider arranging a paddle to Fort Gorges, an abandoned Civil War-era structure on a tiny island that is one of the most popular paddling destinations in Casco Bay. The trip starts off with a basic paddling lesson and then involves a paddle through Portland harbor and across the open waters of Casco Bay to a small beach by the fort's entrance. Your group would have enough time to explore the dark passageways of the fort, check out the view from atop the towering walls, and enjoy a picnic or snack. We can make arrangements to provide a lunch or snacks for your group or we can provide dry bags for you to pack your own food. A kayak or SUP trip at Crescent Beach State Park allows you to combine a visit to one of the state's most beautiful beaches. The state park is located in the town of Cape Elizabeth and is a 15-20 minute drive from downtown Portland. Many of our trips departing from the state park head to Richmond Island, a rugged, forested island facing the open ocean with pristine beaches. During the paddle to the island we look out for the area's abundant wildlife (seals, osprey, seabirds) and enjoy the views of the lighthouses at nearby Two Lights State Park. Once we reach the island we land on a beach and follow a trail to a view of the open ocean. Some people in your group may have a passion for kayaking while others may be dying to try out paddleboarding. Why not give them a choice? You can ask everyone ahead of time which they'd like to try and then we'll split them up when they arrive. However, the two groups (kayakers & paddlerboarders) generally are not able to paddle together to the same destination because they will move at different paces. If you have certain folks in your group who might not want to paddle at all you can also consider arranging other non-paddling activities for your them in the park by the East End Beach-area where we are located. While most of the group is paddling the non-paddlers might be biking on the scenic Eastern Promenade trail, playing beach games or enjoying a picnic. 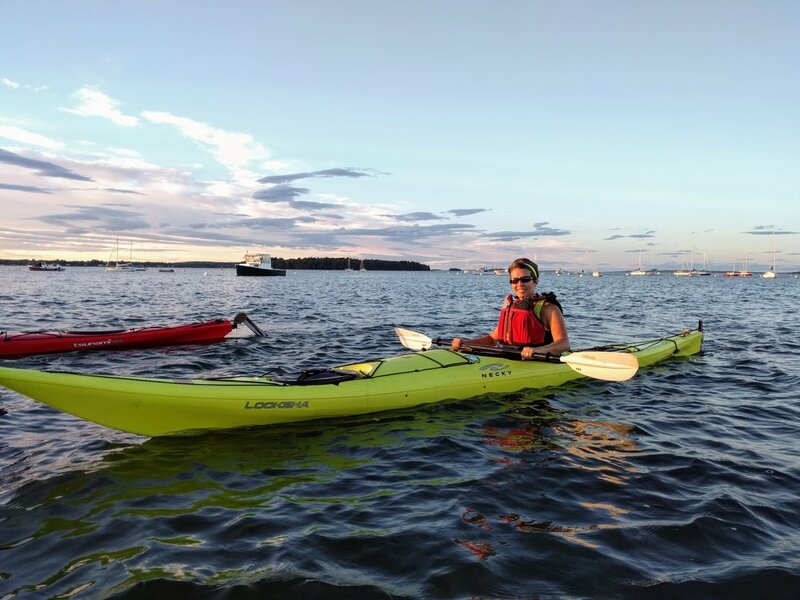 Casco Bay is filled with terrific islands for kayak camping. We offer a range of regularly scheduled overnight trips to these islands and we're always willing to create a customized trip just for your group. You can stay in a yurt on beautiful Cow Island, camp along the cliffs of Jewell Island or island hop for several days all the way across Casco Bay. Visit our Overnight Trips webpage for more information. Is there a certain watery part of Maine that you’d like to explore? We can help make it happen. We offer trip planning services that set you up with all the local knowledge and resources you’ll need to explore the Maine coast on your own. We’ll help anyone from expert kayakers planning to embark on the Maine Island Trail to groups of kids looking to have some fun in the water. We’re also happy to help you connect with other reputable guides and outfitters in other parts of the state. Give us a call.